Staff designer Christie, developed this wonderful Thanksgiving Turkey entirely in PowerPoint 2013 and captured the design stages in this video. 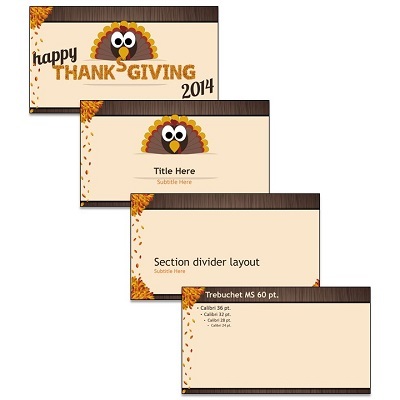 Staff designer, Michelle, created this fun Thanksgiving themed template for TLC to post this year. The template is 16×9 and has the full array of PowerPoint options and layouts preset, and this great animated Theme layout. For a recent employee update presentation that TLC designed for one of our clients, we created a seasonal Fall Time themed set of slides for their employee recognition. 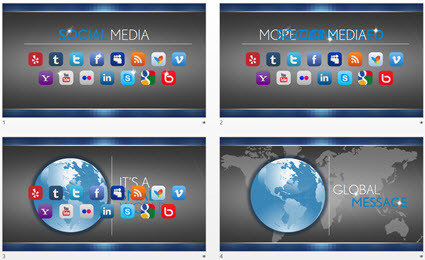 Using PowerPoint 2013 and the ability to layer content on top of video, embed video, and custom motion path animations to develop these wonderful slides. Here is a graphic supplied by the client for a recent presentation design project . Quick – what is wrong? Yes, TLC is very picky about the aesthetics (color scheme, alignment, consistency) AND the message. This is not about PowerPoint, or a project I have worked on, but it is about presentation. This is a massive video project that is truly amazing (not so much for it story telling, but just technology and scope). PowerPoint 2010 introduced the Merge Shapes toolset (trust me, it was hidden, but there). In PowerPoint 2013, the Merge Shapes toolset is much more accessible and refined. 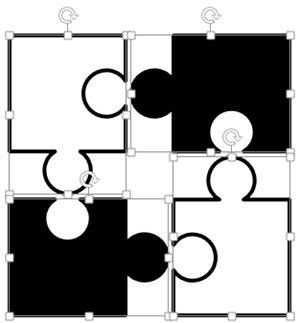 Here is an example we developed creating a much requested graphic element – puzzle pieces (download link below). 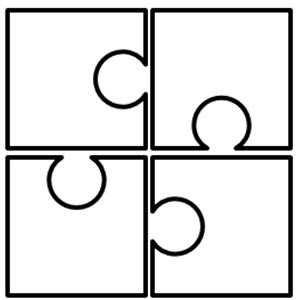 Here are the 4 puzzle pieces. 1. Add 4 squares AND 4 small circles, so there are 8 shapes on the slide. COPY the 4 circles. 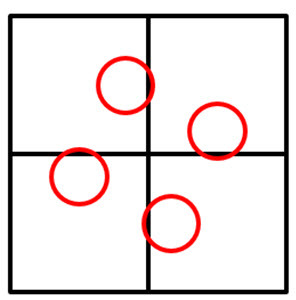 Select all shapes and subtract the circles from the squares to get these 4 shapes. 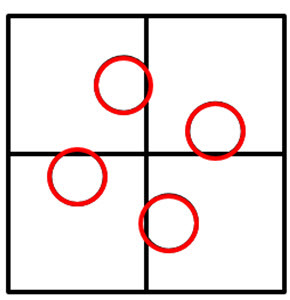 Paste in the 4 circles, so there are 8 shapes on the slide again. 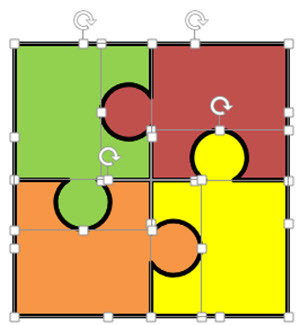 Select all 8 shapes and use the Merge Shapes tool to unite the circles to adjacent squares to create the 4 puzzle pieces. 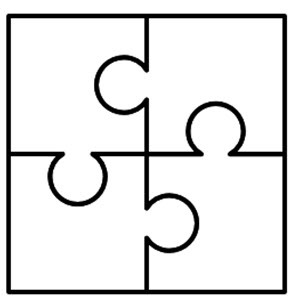 Each puzzle piece is a separate PowerPoint shape. 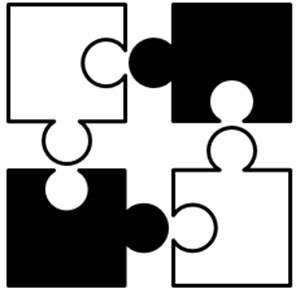 Each puzzle piece is a separate PowerPoint shape that can be resized, animated and recolored directly in PowerPoint. 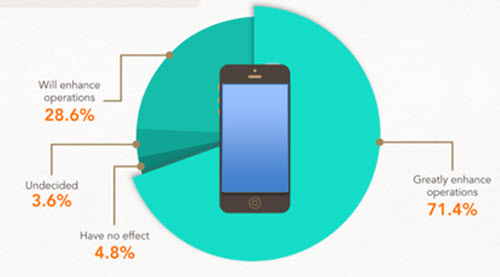 This is the 2nd posting of this sample as the post last week did not include the video of the PowerPoint slides… oops.